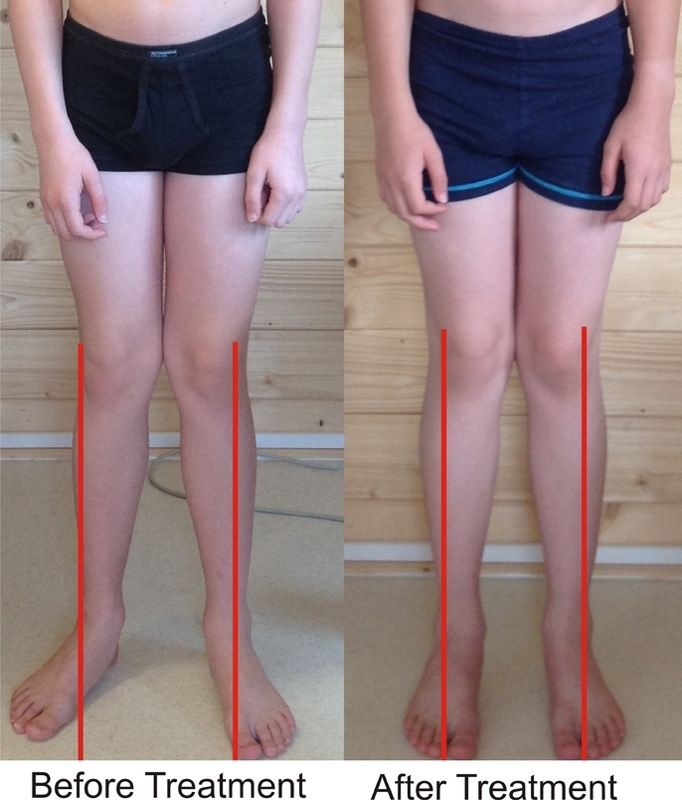 This eleven year old boy had been suffering with right ankle pain during the day and at night, for 3 years before attending Balance-Rite Osteopathy Clinic. He was diagnosed by his Gp with ‘growing pains’ and four months before attending our clinic, was prescribed orthotics to put inside his shoes and trainers, to correct his dropped arches and flat feet. These did not help or improve his ankle pain. After only one half-hour treatment at Balance-Rite Osteopathy Clinic, his symptom of pain had gone and one year on, still has not returned! Continue reading to find out how our different approach to treatment eased his pain without the need for orthotics and why ‘growing pains’ should not be ignored. Laterally facing and pronated feet (turn outwards and flattened arches). What appears to be a longer right leg, with the ankle folding inwards (see lower photograph on the right-rear view). A forward tipping and rotated pelvis, causing the hips to be unlevel and twisted. The twist through the hips caused the thigh bones to rotate and turn the knee caps outwards. The twisted thighs caused the lower leg to rotate outwards- giving a knocked-knee effect. The forces through the leg caused the feet to turn out and the inside arches to flatten with the unlevel pelvis/hips making it worse on the right foot. The position of the pelvis caused the lumbar spine (lower spine) to become mechanically dysfunctional, which in turn caused a collapse of the thoracic (upper spine) and rib cage/chest because of a lack of support below. The head and neck were held in a forward position, due to positioning of spine and lack of support below. Mechanical strain in the spine of both lumbar and low thoracic vertebral joints, muscles, ligaments and soft tissues. Treatment was directed at correcting the mechanical dysfunctions of the whole musculo-skeletal framework and not just the patients feet. The symptoms of ankle pain in this patient were successfully relieved after only the first treatment. However, the underlying mechanical dysfunctions remained, having taken some years to develop as the child grew. The decision was made that treatment would continue to correct these underlying problems, in order for the symptoms not to return. Treatment continued weekly for 3 months and daily exercises were prescribed to be carried out between sessions, which unfortunately were not carried out, however, having reached a more stable and functional musculo-skeletal framework, using our whole body treatment approach, this patient was then able to go to monthly treatments to maintain his whole body mechanics. At age twelve and a half, the pain in his ankle had not returned since his first visit to us at Balance-Rite Osteopathy Clinic and he no longer suffers with ‘growing pains’!